California utility, Pacific Electric and Gas Company (PG&E), owns and operates the 2,100-megawatt Diablo Canyon nuclear power plant located on the coast near San Luis Obispo, an area often referred to as the "Middle Kingdom," with apologies to J.R.R. Tolkien. As part of the plant's owner-controlled area, that area where the owner can control access to the property, PG&E owns 12,000 acres, which includes 11 miles of pristine coastline. None of this coastline is accessible to the public, and for good reason. Before the events of September 11, 2001, the purpose of the owner-controlled area was to provide a buffer zone that could reasonably ensure an uninhabited and unoccupied "no-man's-land" in the event of an emergency at the power plant. After 9/11, although the need to protect the public remained in effect, security issues also required an effective means of controlling the area around the plant. With the government's inability to open the Yucca Mountain Project underground spent fuel repository in Nevada because of more than 20 years of stalling tactics by environmental groups, antinuclear groups, and Nevada state and federal agencies, our nation's nuclear power plants are building interim spent fuel storage facilities at the plant sites. Here, the spent fuel is stored in high-integrity casks until the Federal government takes ownership and the fuel transferred to Yucca Mountain, as mandated by Congress in the Eighties. As with anything to do with nuclear power, the same local, state, and federal agencies that licensed the power plant must also review, approve and license the interim storage facilities. In the case of Diablo Canyon, one of the state agencies involved is the California Coastal Commission (CCC). 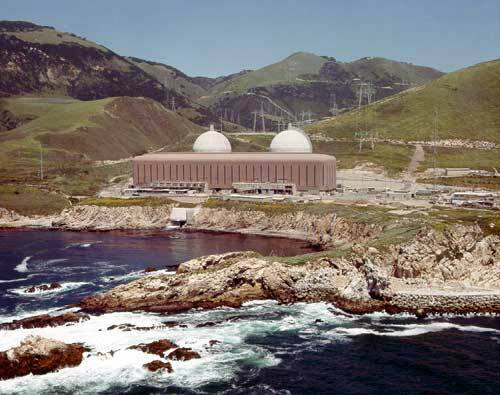 On December 8, 2004, the CCC gave unanimous approval to allow Diablo Canyon to begin construction of an interim storage facility, with one condition - PG&E must grant the public access to three miles of coastline on the plant site. This was not an original stipulation by the CCC. The Commission added the stipulation after the San Luis Obispo Mothers for Peace, the Santa Lucia Chapter of the Sierra Club, and several individuals, all of whom are staunch opponents of the Diablo Canyon power plant, appealed the County Planning Commission's issuance of a coastal development permit to the station. The opponents of Diablo Canyon are not interested in opening up the site to public access for the good of the citizens. Because they understand the legalities associated with operating a nuclear power plant, they recognize that allowing the public into the owner-controlled area, which effectively reduces its size. This will require Diablo Canyon to reassess its safety and security plans, and in all probability lead to changes in radiation dose projections, evacuation plans, security, normal operating dose predictions, and environmental monitoring programs, all of which require public meetings and more opportunities to intervene and raise more questions. As a disinterested reader, you are probably asking yourself, "So what? Raising more questions probably will make the plant safer." The "so what" issue is not about safety, it is about economics. Without an interim spent fuel storage facility, Diablo Canyon will eventually be unable to refuel its twin reactors and the plant will shut down. The California electrical grid, of which the "Middle Kingdom" is a minor customer compared to the population centers in northern and southern California, will lose over 2,000 megawatts of generating capacity. The Diablo Canyon and San Onofre nuclear plants now provide over 15% of the electricity generated within the state's borders. Losing 7.5% of that capacity will make the state even more dependent on outside sources, which currently provide 22% of the state's electrical generation capacity. Electricity prices will rise, but a few brave souls will be able to enjoy the smell of decaying kelp, ride surfboards in the huge Pacific swells that often overwhelm the Diablo Canyon intake pump house, dip their toes in frigid water, and leave their trash and garbage on three miles of what was once a pristine coastline.